The stunningly sophisticated Water Club Condominium is being constructed in the highly desirable village of North Palm Beach. This twenty two story high rise will be the talk of the town! This exquisite building is open and airy with meticulously designed units. The ultra luxurious chic designer appointments will capture everyone’s breath! Each unit boasts unparalleled views of the shimmering intracoastal. The resort inspired world class amenities such as a state of the art fitness center, dedicated boat slips, resort style pool, private clubhouse, lap pool and a yoga/Pilates studio will impress all. 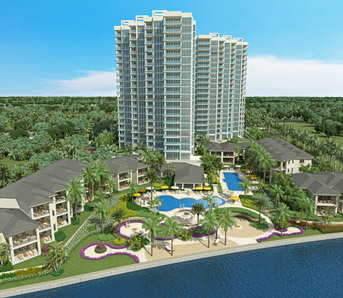 The Water Club offers villa residences as well as the traditional high rise units. The North Palm Beach golf course is just a stone’s throw away. The premier shopping and dining in the immediate area is enviable such as The Gardens Mall, Legacy Shops, Downtown at the Gardens, and Harbourside Place. This area is a dream for the avid boater, golfer, shopper, diner, water sportsman and traveler. With interstate 95 being so close you can easily get to South Beach, Ft. Lauderdale and Orlando in a couple hours. Palm Beach International Airport is only a short drive as well. This is not a place to live this is a lifestyle!